Years 7, 8, and 9 school polo shirt. 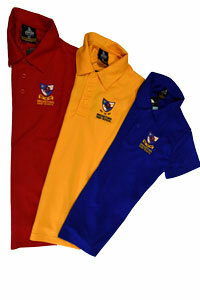 Year 10 school polo shirt and Year 10 Leavers’ Jumper– for current Year 10 students only. Black pants, shorts, or skirts. The shorts, pants and skirts may be of any style. However, they must be completely black and not have any logos, patterns or other colours on them. We do not want students wearing “designer clothing” to school. Shorts and skirts must not be too short and revealing. Similarly, leggings and fitness tights are not deemed pants and therefore may not be worn without shorts or skirt over the top. A long sleeved plain black t-shirt may be worn under the school polo shirt in winter. Any shoes – provided feet are completely covered. Thongs, sandals, backless shoes and ballet pumps are not allowed. Uniform stock is always available from the school office. Denim is not permitted to be worn at government schools. Hoodies are NOT to be worn to school at all, including underneath a school polo shirt. Students who do not adhere to the dress code will be required to change into spare clothing kept at the school especially for this purpose. Students are required to change into suitable clothing for Physical Education. A Physical Education uniform must be worn; the uniform consists of a polo shirt in the House colours and other clothing and shoes suitable for physical activities. Students are also required to bring hats for outside activities. Students who do not bring suitable clothing for Physical Education may be required to change into clothing that is provided by the school; placed in a ‘Buddy Class’ for private study; or given recess and lunchtime detention.